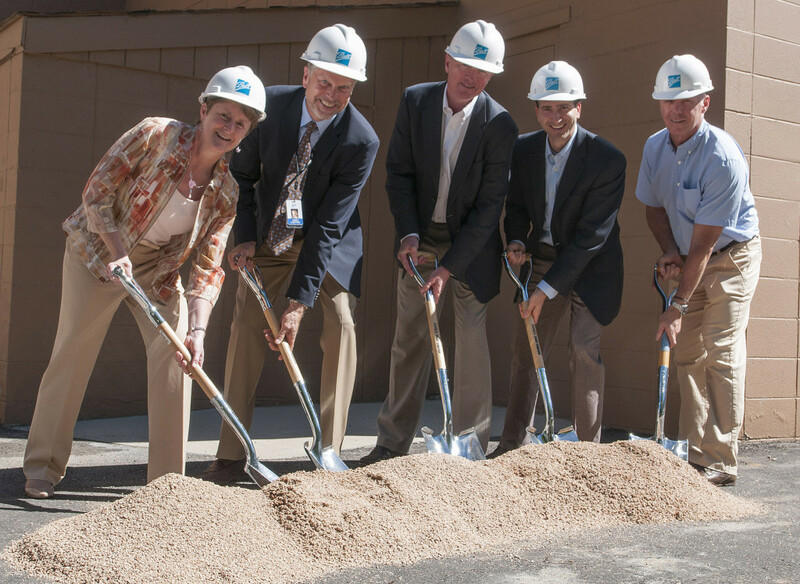 Ball officials including Sherri Fike, Cary Ludtke, Tom Deany, Chris Randall and Alex Chernushin toss a shovel of construction sand at the groundbreaking for Ball’s new GEMS clean room. Image Source: Ball Aerospace & Technologies Corp.
Boulder, Colorado. August 20, 2014 – Ball Aerospace & Technologies Corp. broke ground on a new clean room at the company’s Boulder facility Wednesday to support completion of the Geostationary Environment Monitoring Spectrometer (GEMS) for the Korea Aerospace Research Institute (KARI) under the National Institute of Environmental Research in the Ministry of Environment of South Korea. The new facility allows engineers from Ball and KARI, who have been working on the GEMS program in Boulder since October 2013, to jointly conduct the assembly, integration and test activities required to complete the GEMS instrument. “Ball’s international collaboration with KARI will develop scientifically advanced applications that improve the quality of life on Earth through environmental monitoring instrumentation,” said Cary Ludtke, vice president and general manager of Ball’s Operational Space business unit. The GEMS instrument is the Asian element of a global air quality monitoring constellation of geostationary satellites that includes the Tropospheric Emissions: Monitoring of Pollution (TEMPO) spectrometer. Ball is the TEMPO instrument provider for NASA Langley Research Center and Harvard Smithsonian Astrophysical Observatory on the Earth Venture line program. The GEMS air quality sensor is designed to monitor trans-boundary pollution events for the Korean peninsula and Asia-Pacific region. The spectrometer provides high spatial and high temporal resolution measurements of ozone and its precursors. Hourly measurements by GEMS are expected to improve early warnings for potentially dangerous pollution events and monitor long-term climate change. Ball Aerospace and KARI have teamed to design, fabricate and test GEMS, which is manifested on KARI’s GEO-KOMPSAT-2B geostationary satellite for a 2018 launch.